THE 2 IN 1 HAMMOCK THAT TURNS INTO A BATH SEAT. This latest innovative bath seat from Jané is specially made with softer materials and a special non-slip inner material that’s not only safer but more comfortable against your baby’s precious skin. The innovative 2-in-1 design means it can first be used from birth as a hammock and then as a seat as your baby grows. It’s Evolutionary and easily, quickly and conveniently convertible. It has a soft backrest and seat with front opening. Material: polycarbonate plastic. EVA seat and backrest. 100% Soft. New 2 in 1 bath hammock & seat. The hammock is suitable from birth and then turns into a bath seat when baby can sit up. Special non-slip inner material on the base and backrest helps to stop baby sliding around when bathing, plus is more comfortable against baby’s delicate skin. Padded reclining backrest and seat for maximum comfort and keeping the baby’s body at the same temperature. Front opening, so baby can be seated and taken out more easily, without hurting his legs. Foldable so it can be stored away. Suction pads on the base to secure it. Note: Available in 2 assorted neutral colours. Only one will be picked at randem and despatched. We used this item to transfer our 6 months old to the big bath. It is an aid, not security equipment but does free your hands for that shampoo or little play with toys. It fills with water in the bathtub and the suction pads work well to hold the chair in place. My daughter loves bathing with it (so far in lounging mode) so I would definitely recommend. When not in use we fix it to the bath tiles and it stays in place. Easy to clean too. Bought this hoping to be pleased as it is an expensive item. Great product! Allows me to bath our 4 month old and 3 year old simultaneously. Our 4 month old loves it and kicks his legs as soon as he's lying down in his seat. Really saves my back, as I no longer have to hold him while bending over the bath, and makes it easier to watch both kids. One review stated that the back would tip back when in the 'seat' mode, I tested it before using, and I can’t see how this can happen when used properly - you need to ensure the coloured T-bar clicks into the sides, when it's clicked in, it's very secure. I pushed back using my hands with a lot of force, and it didn't move. Still yet to use the sitting up position, but this is a product that will last a good few months - the only one I could find that had recline and sitting positions. It fills up with water to keep it weighted I guess, and you really have to pull the suction cups to remove it from the bath - sticks really well. Expensive, but worth it. Hi, please can you tell me the dimensions of this bath seat, both when upright and reclined. Thanks. Hi, please can you tell me the external dimensions of this bath seat as I have a narrow bath and want to make sure it will fit. I've read reviews for your other bath seat, (the fluid ring) that says it is quite wide and therefore doesn't always suction to the bottom of narrow baths properly. Many thanks. 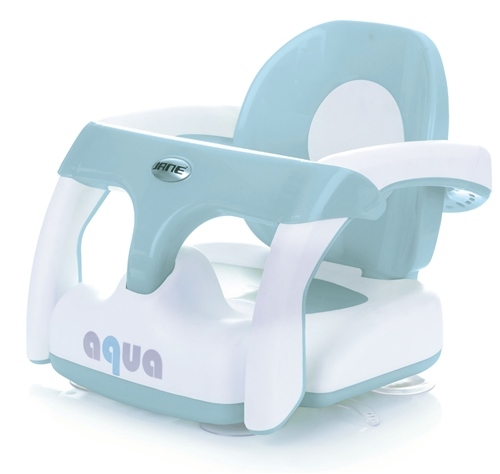 Jane UK Replies: Hi Sarah, No problem, the widest point of the Aqua is 34cm (at the outer edges of the handle) and the maximum length (with the seat full reclined) is 54cm from end to end. I hope that helps! how does it not float? are the suction cups the only thing holding it down? Jane UK Replies: Hi Beck, The suction cups keep it very firmly attached to the bath and also the base has drainage holes so water can freely move in and out of the seat base. Jane UK Replies: Hi Danielle, the assorted colours are all currently neutral, so would do boy or girl. I believe our stocks are the teal aqua or jade green colours at present.